Congratulations go to Brian Donohue for his work on the Star Ledger Live site and all its interesting stories. The World’s Tallest Water Sphere site was interviewed for a segment back in January of 2009. Brian Donohue has won an Emmy award for his work in interactive media. With a love for the World’s Tallest Water Sphere, New Jersey, and all it’s weirdness, what else could be done but to photograph the Emmy alongside the WTWS. We like the look! 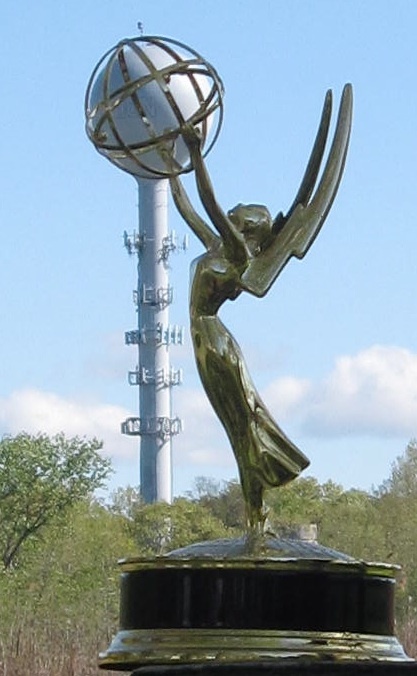 If ever there were structural problems, what else would be a better proposal than to have a giant, golden, art deco, statue prop the giant sphere? This entry was posted on Thursday, April 22nd, 2010 at 5:39 pm	and is filed under Art, Experiences, Photos. You can follow any responses to this entry through the RSS 2.0 feed. Both comments and pings are currently closed.